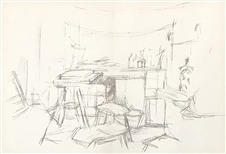 Alberto Giacometti original lithograph "The Studio with Bottles"
Medium: original lithograph. Catalogue reference: Lust 100. Printed for Derriere le Miroir (issue number 98) and published in Paris in 1957 by Maeght. Sheet size: 15 x 22 inches. There is a center fold, as originally published. Not signed. 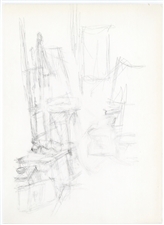 Alberto Giacometti original lithograph "The Street"
Medium: original lithograph. From the rare issue of Verve (Volume 7, Number 27-28), published in Paris by Teriade in 1952. 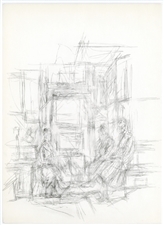 Verve was founded in 1937 to showcase original lithographs by the leading artists of the day, with outstanding technical quality. Sheet size: 13 3/4 x 10 inches (348 x 255 mm). 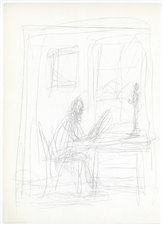 There is an original Giacometti color lithograph printed on the other side: Click here to see it. Not signed. Condition: there sheet has been slightly trimmed. Medium: original color lithograph. From the rare issue of Verve (Volume 7, Number 27-28), published in Paris by Teriade in 1952. 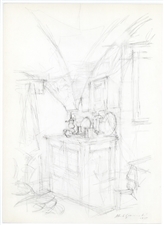 Verve was founded in 1937 to showcase original lithographs by the leading artists of the day, with outstanding technical quality. Sheet size: 13 3/4 x 10 inches (350 x 255 mm). 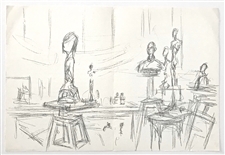 There is a black and white original Giacometti lithograph printed on the other side: Click here to see it. Not signed.